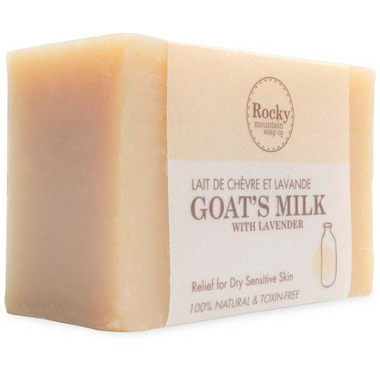 Rocky Mountain Soap Co. Goats Milk with Lavender is blended with soothing and hydrating Goat's Milk. The natural oils in the milk are easily absorbed to help meet the skin's moisture needs. It is safe to use on even the most sensitive skin types. Lightly scented, this bar contains Lavender essential oils to calm and soothe. Skin type: Dry, or Sensitive Suitable for: Face, Hands & Body. Wonderful! I have rosacea and even use this on my face with no flare ups. Very mild but not drying like other soaps. Gorgeous scent, very long lasting and great value for money. I've never been disappointed with these soaps ... the scents are subtle, the bars are long lasting, we use a variety throughout the year depending on our skin requirements and are always pleased with them (my husband likes them too!) I'm always looking for products made from natural ingredients and Canadian companies -- Rocky Mountain Soaps fit the bill! Rocky Mountain's soaps are always a winner. The Goat's Milk bar is quite softening. Though some describe the scent as strong, for me, this bar has a beautiful subtle scent. In love with this product. Had some eczema patches and this stopped them in their tracks. Lovely scent and the feel after a shower is heavenly. Cheaper than my previous bar as well. So luxurious. Very moisturizing and the scent is gorgeous! Buying a case! Love Rocky Mountain products, this soap has a nice scent and cleanses without drying out skin. Gentle scent. Not drying. Bar lasts at least 2 weeks unlike most natural soaps that use up very quickly! I love all Rocky Mountain soaps! This is a very nice soap. Does not dry the skin and, of course, lavender is not just a fragrance - it is very healing as well. Great combination for irritated and itchy skin. This is now my husband's holy grail. He has very sensitive skin and he has a lot of difficulty finding soap and body wash that doesn't dry out his skin and cause rashes. This soap is sensitive On his skin and get him clean too. It has a little fragrance too which is nice. He usually has to get everything unscented. It also lathers rather nicely. I definitely recommend it if you have sensitive and/or dry skin. So unlike a different soap I bought on here that claimed it moisturized skin, this actually does it. It is still soap so don't expect miracles but of all the natural and chemical soaps I've used this doesn't not pull out all the moisturize in my skin. It smells lovely too. The only down side is that it is relatively expensive for such a small bar.